COX Super Stunter - Balsa build ... 40 years later..
Re: COX Super Stunter - Balsa build ... 40 years later..
That is a very cool project! It'd make a great "Cottage Shop" kit for those of us that had the Super Stunter back in the day!!! pegin964 wrote: Well, chinese Monokote removed, but leaves green greasy surface, some kind of oil paint soaked balsa, and i try with Oracover and Hobby King Monokote , over this, but results are poor, both new monokotes peel off, not sticking to greasy balsa. I clean balsa with acetone, but without better result. So, i will leave this build aside, to see will the surface dry , or coat it with some lacquer and cover it with tissue paper. But for now, i lost interest ( and nerves) with this build. Noooo! Please publish the drawings so that your project can live on in others' build rooms (like mine!). The project is salvageable. As to the weight problem, I'm going to guess too heavy grade of balsa used. Perhaps cutting some holes in fuselage surfaces and covering fuselage with light weight tissue or spun synthetic with dope along with some holes in the ribs can get it back closer to weight of plastic version. If not, maybe an engine switch to a two port Medallion will do the trick. Yes, will certainly finish it, but not this weekend , or next month , but probably for next flying season. 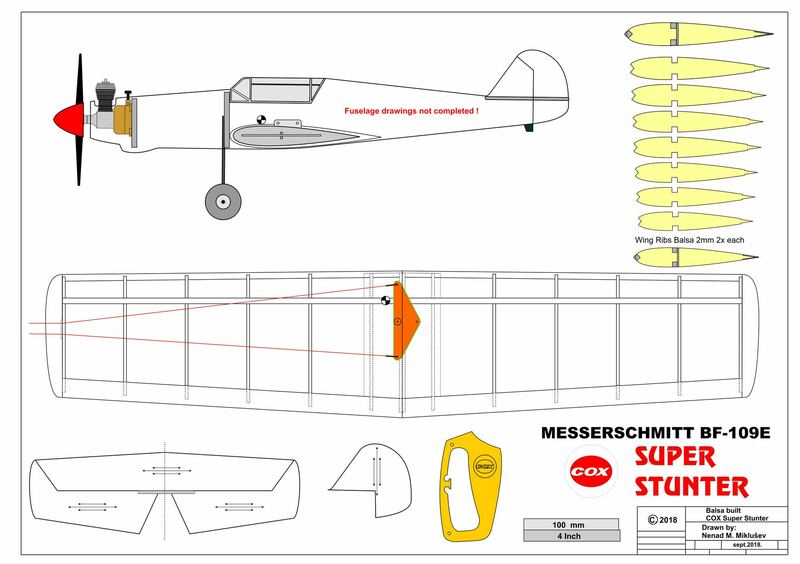 For now, unfinished (fuselage details not complete) drawings, Jpeg, resized, not in scale and PDF file, full size, A1 format. So sorry to read about this sad development. I was following the progress and you did a fine build, so I was really anticipating seeing it fly in a few days. I've always had good luck with Top Flight Super Monocote myself. My buddy likes Ultracoat. Acetone isn't always that great of a decreasing agent. You might try just lacquer thinner to clean that greasy surface off the balsa. I have added this one to my list! That wing looks good. I'm on standby waiting for the fuselage. Even now, this could be used to make a really lively profile model as it is! Thanx, will complete this drawings, ASAP. If Stunter fails, there is "PlanB" , Sure Start COX 049 powered profile balsa "Kraguj", this evening do few short flights, total 10-12 minutes, and made short Night Flight video. Something is wrong with my fuel, could not set max rpm's and plane is just slow and lazy. Will try with fresh fuel, just need to find one with at least 5% Castor. All the fuels locally available are car racing high nitro & synthetic oil. Is it safe to try COX with synth only fuel ? I'll let others weigh in on finer points, but say, 22% oil with 100% of that synthetic oil is a non-starter, as is 5% castor + 17% synthetic. You might get by quite alright with 11% +11% in sport flying mode. BTW, I watched your video. How long are your flying lines? Will see which fuel is available here and if must , will add some castor by myself. 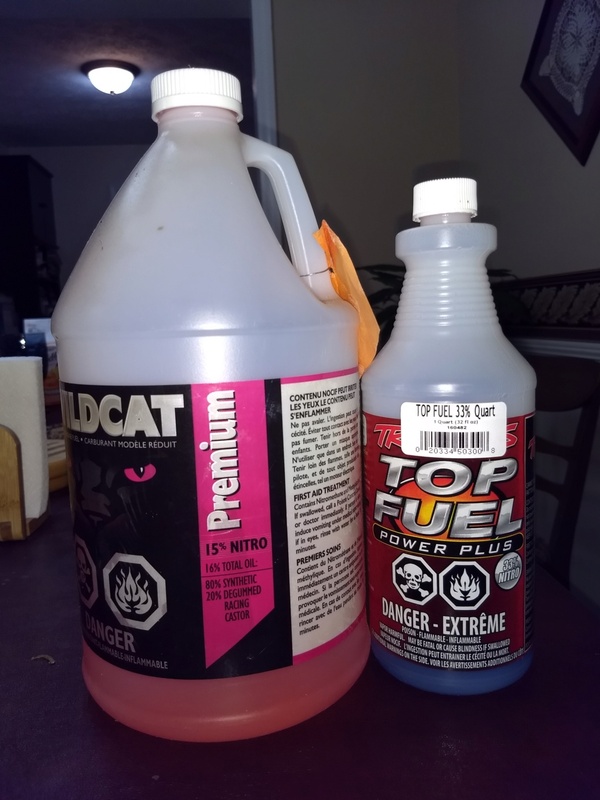 If you can find high nitro, low synthetic oil content, no castor, then you can add quite a bit of castor to bring up castor oil content while reducing the nitro content. There is an online calculator that can mix and match fuels, and spit out the amount of castor to make your target fuel. Last fuel I bought was a quart of Traxxas Top Fuel Power Plus. 20% nitro, all synthetic oil. I poured 16 ounces of the stuff into another container, and added 2 ounces of castor oil. 18 ounces total with 2 ounces being castor oil makes about 11% castor plus whatever the synthetic oil content is. My .049s seem to run fine on it. I get about 4 second laps on 39' lines, and a 7 ounce plane. The problem with the Traxxas fuel is that oil make-up IS NOT marked in the bottle, nor their website. I had to glean the content ASSUMING they blend for their buggies/truggies/cars as called out in their "owners' manuals. This yields approximately 8 oz at 23% Nitro, 19% Oil. My notes indicate this gives 8% Castor Oil, which ISTR being of the total fluid volume. My glow plugs stay pretty clean. The oil splattering out of the exhaust is pretty clean, and wipes off the models with little effort. When engives are bench run, they don't get too hot when measured on the head with a laser thermometer.